Not only a painter but also a poet, Dante Gabriel Rossetti was born in London in 1828, where his father, an exiled Italian painter and Dante scholar, served as Professor of Italian at King's College. The family was steeped in literature and art. 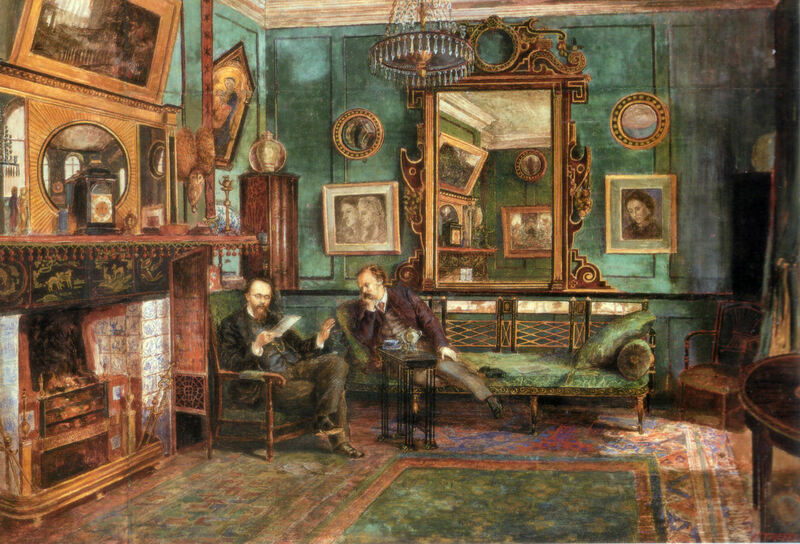 All three of the Rossetti siblings would have important effects on late-nineteenth-century English culture: Christina became a well-regarded poet, and William Michael became an influential critic. Dante Gabriel spent the earliest part of his career torn between painting and writing, but entered the prestigious Saas Drawing Academy in 1841 and was established as a professional painter by the late 1840’s. (He continued to write poetry and make transplantations from Italian.) He was a leader in the Pre-Raphaelite Brotherhood, an English art and culture movement which he founded with the critic Leigh Hunt and the painters Holman Hunt and Sir John Everett Millais. Pre-Raphaelite aesthetics were not perfectly unified: Hunt and Millais preferred to create a naturalistic world in which dramatic events may take place among men and women; Rossetti often drew on classical, Biblical, and literary subjects. Dante’s Girlhood of the Virgin Mary, exhibited in 1849-and signed by the Brotherhood’s collaborative initials “P.R.B.”-received much enthusiastic attention. Yet Rossetti soon withdrew from the world of public exhibitions, preferring to accept commissions and sell works to private clients. After 1851 he worked mainly in watercolors and chalk, drawing themes and subjects from Shakespeare, Dante, and the Arthurian legends. His work was championed by the critic John Ruskin, in part for its very naiveté; Rossetti’s income from commissions and sales was impressive. In the late 1850’s the younger artists William Morris and Edward Burne-Jones worked with Rossetti in painting Arthurian frescoes for the Oxford Union Building Debating Hall, thus forming a second wave of Pre-Raphaelites. Dante became a partner in Morris’s decorating firm and thus had a impact on revolutionary new ideas in design. In the 1850’s and early 1860’s he used Elizabeth Siddall, whom he married in 1860, as a model for many paintings; after Siddall’s death in 1862, Rossetti continued to paint many pictures of beautiful women, who are often presented as dangerously seductive and melancholy. Rossetti also helped pioneer the use of Japanese images and styles in modern painting. He died in 1882.